Citation: C N Trueman "Henry VIII – Timeline"
Any timeline of Henry VIII will show a great number of major events that changed the course of England’s history. A timeline for Henry VIII will show how a divorce from Catherine of Aragon led to the English Reformation – this led to the break from the Catholic Church in Rome and eventually in the reign of Edward VI was to lead to the establishment of the Church of England. 1527: probable year that Henry VIII decided to annul his marriage to Catherine. 1528: Henry VIII joined an alliance with Francis I and Clement VII against Charles V.
1529: There was a failure to reach an agreement over the annulment of the marriage between Cardinal Wolsey and Cardinal Campeggio. The case was moved to Rome. The year in which Wolsey lost power. The year in which the Reformation Parliament first sat – one of seven sittings. Anti-clericalism was rife in this Parliament. 1530: an attempt was made to win the support of European universities for Henry’s case for an annulment. Thomas Cromwell joined Henry’s Royal Council. ‘Collectanea satis copiosa’ – evidence against the Pope’s powers – was compiled. 1532: ‘Supplication against the Ordinances’ drawn up by the House of Commons. This led to the Submission of the Clergy by Convocation’. Cranmer appointed Archbishop of Canterbury. The Act in Restraint of Annates was introduced which stopped all but 5% of payments by newly appointed senior clergy to the Pope. It came into effect in 1533. 1533: Henry secretly married Anne Boleyn (January 25th). Marriage between Henry and Catherine of Aragon was annulled in April by Cranmer. Act in Restraint of Appeals introduced. Anne was crowned queen on May 31st. Elizabeth was born on September 7th. 1534: Pope Clement VII ruled that Henry’s marriage to Catherine of Aragon was valid. The Act of Supremacy was introduced. Thomas Cromwell was appointed day-to-day controller of the Church. 1536: start of the dissolution of the smaller monasteries. Cromwell issued his first set of ‘Injunctions’. Anne Boleyn executed (May 19th) and marriage to Jane Seymour quickly followed. Pilgrimage of Grace started in October. 1538: the first publication of the English translation of the Bible. Second set of Injunctions issued by Cromwell. These ‘discouraged’ specific Roman Catholic ‘superstitions’. 1539: The Act of Six Articles was issued, which reaffirmed most Catholic beliefs. 1540: Marriage to Anne of Cleves (January). It was annulled in July. 1543: the ‘King’s Book’ was published, which has been used to provide evidence that Henry still supported Catholicism. 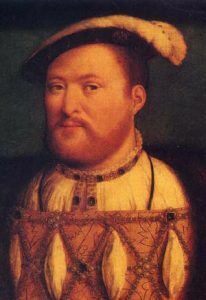 1547: Henry VIII died (January 28th) aged 57. His reign had lasted 37 years and 8 months.